Back to school time means packing lunches, keeping track of homework, bus rides, and – almost inevitably – colds. Putting that many small children (who are still learning about hygiene, germs, and how illnesses are passed from one person to another) in a confined space almost assuredly means someone’s going to get the sniffles. Perhaps the most common way for a child to contract an illness is to rub their eyes or their nose after the germs that cause the cold are on their hands. Studies show that only about half of middle school and high school students wash their hands after going to the bathroom. Of those, only about a third of girls and 8% of boys used soap. Work with your child on getting in the habit of washing his hands every time he uses the restroom, as well as both before and after meals. Prevention truly is the best medicine. Make sure your children are up to date on their scheduled vaccines, and talk to your child’s doctor about getting the seasonal flu vaccine. The CDC recommends that everyone over six months old receive the flu vaccine. While the flu vaccine doesn’t protect from all the many strains of the flu out there, it does protect against the ones that are thought to spread most rapidly each year. While washing is ideal, it’s not always practical or possible. Check with your school’s policy, of course, but if it’s permissible send some sanitizing gel with your child to school. Many schools today also provide hand sanitizer, as well. Show your child how to use the hand sanitizer effectively: it should be rubbed all over the hands and fingers until it is dry, or for about 30 seconds. You don’t want to scare your child or turn her into a germophobe, but you can talk with your child about how colds spread. Let her know that, if she sees another child coughing or sneezing, they should give them some room. Your child, likewise, should cover her face when she sneezes or coughs. 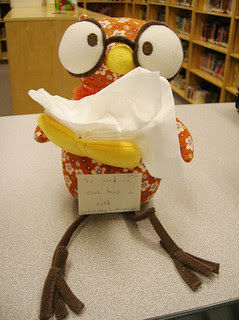 Ideally, she will cough or sneeze into a tissue, dispose of the tissue after, and then wash her hands. Provide your child with his own pencil box. Check it regularly to make sure that it’s stocked with everything he’s going to need to get through the school day, such as pencils, erasers, crayons, colored pencils, rulers, and more. You might decide to include mechanical pencils, which will allow your child to avoid one of the most germ-infested places in a school classroom: the pencil sharpener. While you don’t want to turn your child into someone who doesn’t share, you should talk about what is OK and what’s not OK to share while at school. Sharing personal items like lip gloss, make-up, creams, lotions, and more can all lead to skin infections like MRSA. Watch out for earphones, towels in the locker room, jerseys for sports, and other sporting equipment like football helmets or baseball gloves, too. The places in a school where germs like to hang out aren’t always the most obvious. Water fountains and cafeteria trays are among the most common spots for germs, while restroom toilet seats may be less likely to harbor cold-causing germs. Talk to school officials about the cleanliness of drinking fountains and lunch trays. If the school allows it, send a water bottle to school with your child each day, so as to avoid the water fountain altogether. Schools are often financially stretched, and teachers may or may not have access to the resources they need to provide a healthy and germ-free classroom. Consider donating items like hand soap, sanitizer, and tissues. Paper cups for water or other items might be useful, as well; talk to your child’s teacher about what might be most appropriate and needed. can’t avoid colds altogether. When children get together in the concentration they do at school, germs are inevitably going to make it past the barriers you create. Follow these steps to minimize the damage. Dorothy Wheaton, PA-C, is the lead clinical provider for Careworks Health Clinics, an organization that offers multiple urgent care centers and walk-in healthcare clinics in the Northeast United States.